Big trout like this one caught with LocalLinesCharters.com get happy when it cools and the mullet move. As summer ends on the Space Coast and the north winds start to blow. Hordes of transient mullet migrate south fleeing the colder northern summer haunts. The spectacular sight of that favorite fishing spot so loaded with mullet that the water appears to boil and all your favorite gamefish gorging on this mobile buffet will surely burn into your memory bank. Though some of the most dramatic displays of predator vs. pray action will take place on the beaches of Brevard County do not overlook the mass migration that makes its way through the Lagoons and mirrors the beach run in fishing opportunities. I will out-line some tips and tactics that should put you on the fish during the mullet run. Also, be sure to swing by the official Local Lines Facebook page for tips, hints, and pics’……….. Facebook.com/Local Lines Guide Service. The cold fronts are king so pay attention to the weather so you can catch this run. Some years its wide open fishing for weeks but others have been but a trickle over days and weeks, so it takes a bit of homework to hit it right. The “run” can be enjoyed by boat, foot, or Kayak. Some of the best beaches in Brevard are Playalinda, Cocoa Beach Pier (area), and around both Port Canaveral/Sebastian Inlets. Also, all of the worm rock reefs from Satellite Beach through Indialantic hold predators in wait. Of course a live mullet will get hit and they are best rigged on a fishfinder rig with the appropriate weight to hold bottom. But my favorite way to fish the run is with Large Top water plugs or large floating lipped/diver plugs (same color choices as the lagoon section) windcheeters fished on higher tides. This is true pot luck fishing that could have you hooked to a snook or redfish on one cast, then a 100lb. tarpon or 6ft. shark on the next. As with the beaches our lagoons will be host to the mass transient schools of mullet but many will find their wintering spots and stay. Look at it like this; Carolina mullet find our winter waters comfortable and warm, but our mullet might spend Christmas in the Keys. Everything must shift south! 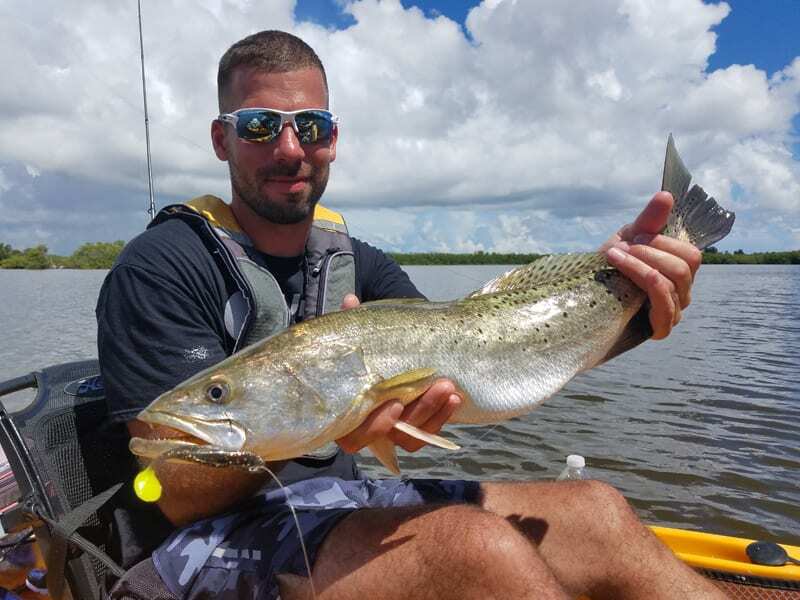 Points, dock lines, and edges of flats will all act as ambush points for reds, trout, snook and some tarpon. Pot holes on open flats will also be utilized on occasions when the bait is more spread out. Of course a live free-lined mullet will work great, but for those that don’t want to mess with all that bait plugs work great. The low light times will have any top water lure of your choice getting smacked around, but cooler temps account for some good all day fishing utilizing 1/8oz.weedless keeper style hook accompanied with a Slayer Inc. SST. With so much bait present I stick with the two basic color choices of natural vs. bright and bold. If natural is getting lost and not hit go to white, or vice versa. These predators have their choice of snacks and sometimes they call for crazy different, but other times they want something that looks the same but acts injured, slower, or easy to eat.